Stephen E. Ambrose draws upon extensive sources, an unprecedented degree of scholarship, and numerous interviews with Eisenhower himself to offer the fullest, richest, most objective rendering yet of the soldier who became president. He gives us a masterly account of the European war theater and Eisenhower's magnificent leadership as Allied Supreme Commander. 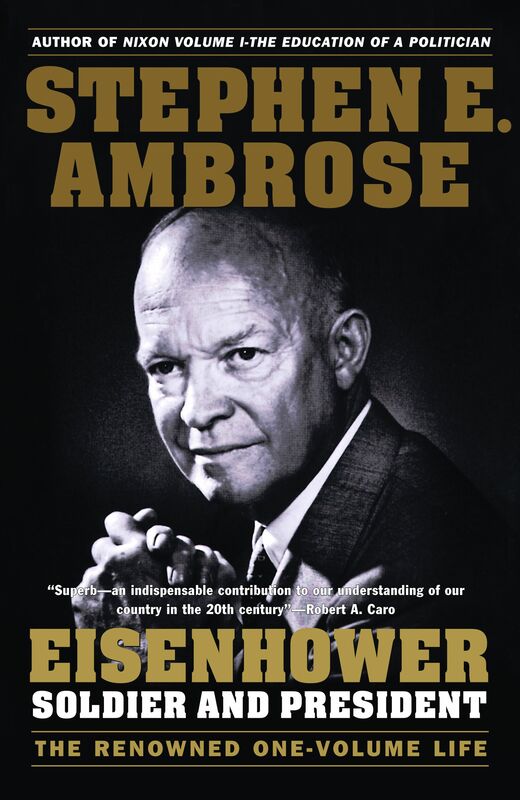 Ambrose's recounting of Eisenhower's presidency, the first of the Cold War, brings to life a man and a country struggling with issues as diverse as civil rights, atomic weapons, communism, and a new global role. Along the way, Ambrose follows the 34th President's relations with the people closest to him, most of all Mamie, his son John, and Kay Summersby, as well as Franklin D. Roosevelt, Winston Churchill, Charles de Gaulle, Harry Truman, Nixon, Dulles, Khrushchev, Joe McCarthy, and indeed, all the American and world leaders of his time. This superb interpretation of Eisenhower's life confirms Stephen Ambrose's position as one of our finest historians. He was born on October 14, 1890, in a small rented frame house, not much more than a shack, beside the railroad tracks in Denison, Texas. He was the third son of David and Ida Stover Eisenhower. They were members of the Mennonites, fundamentalists in their religion, and pacifists. David was a common laborer -- he had once owned a general store in Hope, Kansas, purchased with an inheritance from his father, but it had failed. In 1891 he moved to Abilene, Kansas, where a relative had found him a job as a mechanic at the Belle Springs Creamery. When the Eisenhowers stepped onto the train platform in Abilene, David had in his pocket the sum total of his capital, $10. In a small two-story white frame house at 201 South East Fourth Street, set on a three-acre plot, David and Ida raised six strong, healthy boys -- Arthur (born 1886), Edgar (1889), Dwight, Roy (1892), Earl (1898), and Milton (1899). The Eisenhowers were respected around town, but the family was in no way prominent. David held no elective office, provided no community leadership. Still the Eisenhowers were content. The parents were frugal out of necessity, but they were proud and ambitious, if not for themselves, then for their sons. "I have found out in later years we were very poor," Dwight said on June 4, 1952, on the occasion of laying the cornerstone of the Eisenhower Museum in Abilene, across the street from his boyhood home, "but the glory of America is that we didn't know it then. All that we knew was that our parents -- of great courage -- could say to us, 'Opportunity is all about you. Reach out and take it.'" By most standards, David and Ida never reached out to take that opportunity themselves. Instead they invested in their sons the hopes they once had for themselves. They taught the simple virtues of honesty, self-reliance, integrity, fear of God, and ambition. They wanted their sons to succeed in a wider setting than Abilene, or even Kansas. They gave the boys the feeling, as one of them later put it, that "if you stay home you will always be looked upon as a boy." Eisenhower's home life revolved around worship. Every day, morning and night, the family members got down on their knees to pray. David read from the Bible before meals, then asked for a blessing. After the meals the boys washed the dishes, then gathered around David for Bible reading. "Finally there was bedtime," Earl recalled, "when Dad got up and wound the clock on the wall. You could hear the ticking no matter where you were. When Dad started winding, you might as well get ready for bed, for that was the bedtime signal." During the day, the boys saw little of their father, who worked in the creamery from 6:00 A.M. to 6:00 P.M. "Mother was by far the greatest personal influence in our lives," Dwight remembered. She supervised their chores, made their meals, selected and mended their clothes, soothed their hurts, praised their accomplishments, and lightened the atmosphere. Milton, the youngest, said that "Father and Mother complemented one another. Mother had the personality. She had the joy. She had a song in her heart. Dad had the authority." In a family of six boys, competition was the natural order of things. Who could do the best job at this or that task? Who could run the fastest? Jump the highest? Lift the heaviest weight? Read the Bible aloud most accurately? Daily, in countless ways, the boys tested themselves against one another. David and Ida encouraged this competition, encouraged them to be ambitious to do the best. Most of all, each of the boys wanted to be the toughest, and they fought among themselves to find out who was the best scrapper. One day Ida was baking in the kitchen. Dwight and Edgar began a fight on the kitchen floor. Soon the older and heavier Edgar was sitting astride the prostrate Dwight, giving him a pounding. "Give up?" Edgar shouted. "No!" Dwight gasped. Edgar grabbed Dwight's hair and began to thump his head against the floor. Earl rushed in to help Dwight. Ida, without turning away from the stove, said sharply to Earl, "Let them alone." David encouraged his sons to stand up for themselves, with one another and in their relations with boys outside the family. Dwight recalled that his father never wanted to see his sons beaten by their playmates in anything, least of all in a fight. One evening David returned from work to see Dwight being chased by a boy about his own size. "Why do you let that boy run you around like that?" he demanded. "Because if I fight him," Dwight replied, "you'll give me a whipping, whether I win or lose!" Instantly, David replied, "Chase that boy out of here." Dwight did. The chief characteristic of Abilene in the 1890s was that it was typical of small-town midwestern America, which meant, for young Dwight, that it reinforced everything he learned from his parents. There was, first of all, the emphasis on self-sufficiency. Contact with the outside world was minimal. There were few taxes to pay to, and almost no services provided by, the government, save on the local level. The city paid for and ran the school system. Families took care of their own sick, insane, crippled, elderly, or just down-on-their-luck members. There was no police force because in a town small enough (less than four thousand population) for everyone to know, and trust, everyone else, there was no need for one. There was a strong emphasis on hard work, on getting things done. Little or no time was wasted on reflection or introspection. Everyone in Abilene worked, most of them at hard physical labor. Unemployment was virtually unknown, even among children. The youngest worked around the house; eight- to twelve-year-olds held odd jobs; teen-agers found regular employment. Abilene was cautious and conservative in its social outlook, religion, and politics. Everyone was Christian, of European descent, and nearly all voted Republican. There was a strong sense of community, a feeling that the world was divided into "us" (the residents of Abilene, Dickinson County, and to some extent the state of Kansas) and "them" (the rest of the world). Abilene was like a large extended family, giving to its residents a feeling of security. Threats to that security came not from within but from without, primarily in the form of adverse weather or falling commodity prices. A man was judged by how hard he worked and whether he paid his bills on time, a woman by how well she ran her household. It was assumed that a man's success depended solely upon his output and that the unsuccessful had no one to blame but themselves. "The isolation was political and economic," Milton recalled, "as well as just a prevailing state of mind. Self-sufficiency was the watchword; personal initiative and responsibility were prized; radicalism was unheard of." To the Eisenhower boys, Abilene seemed an ideal place. It provided more than sufficient scope for a growing boy to discover himself and develop his physical capacity in an atmosphere of security, friendliness, and tolerance of boyish pranks. In 1947, Dwight Eisenhower spoke from his heart about the town that he loved. He said that Abilene "provided both a healthy outdoor existence and a need to work. These same conditions were responsible for the existence of a society which, more nearly than any other I have encountered, eliminated prejudices based upon wealth, race or creed, and maintained a standard of values that placed a premium upon integrity, decency, and consideration for others. Any youngster who has the opportunity to spend his early youth in an enlightened rural area has been favored by fortune." Just as Dwight loved Abilene, so did Abilene love him. He was a popular boy, well known for his curiosity, his fun-loving ways, his big smile, and his energy. He had a catchy nickname, "Little Ike" (his older brother Edgar was called "Big Ike"). But Little Ike had a terrible temper. Anger would possess him, take complete control, make him oblivious to anything else. The adrenalin rushed through his body, raising the hair on the back of his neck, turning his face a bright beet-red. On Halloween night, 1900, his parents gave Arthur and Edgar permission to go "trick or treating." Little Ike begged, pleaded, and argued to be allowed to go along, but his parents insisted that he was too young. Anger overwhelmed him. He rushed outside and began pounding the trunk of an apple tree with his bare fists. He sobbed and pounded until his fists were a raw bleeding mass of torn flesh. Finally his father grabbed him by the shoulders and shook him until he gained some control over himself. Dwight went to his bed and cried into his pillow for an hour, out of resentment and rage. His mother came into the room and sat beside him. She took up his hands, putting salve on them and then bandages. After what seemed to him to be a long time, she said, "He that conquereth his own soul is greater than he who taketh a city." She went on to tell him how futile and self-destructive anger was, and how he, of all her boys, had much the worst temper and the farthest to go in conquering it. When he was seventy-six years old, Eisenhower wrote, "I have always looked back on that conversation as one of the most valuable moments of my life." Getting control of his temper, however, did not come easily or quickly. Two years after the apple-tree incident, when Dwight was twelve and Arthur sixteen, Arthur incurred his little brother's wrath over some trifling matter. Raging, but frustrated because Arthur was much too big for him to attack with his fists, Dwight looked around. Seeing a brick at his feet, he grabbed it and flung it with all his might at Arthur's head. Arthur just managed to duck out of the way -- Dwight had fully intended to hit him. Dwight attended Lincoln elementary school, directly across the street from his home. The curriculum emphasized rote learning. "The darkness of the classrooms on a winter day and the monotonous hum of recitations," Eisenhower wrote in his memoirs, "...are my sole surviving memories. I was either a lackluster student or involved in a lackluster program." He came to life for the spelling bee and arithmetic. Spelling contests aroused in him his competitive drive and his hatred of careless mistakes -- he became a self-confessed martinet on the subject of orthography. Arithmetic appealed to him because it was logical and straightforward -- an answer was either right or wrong. The subject that really excited him, however, was one that he pursued on his own, military history. He became so engrossed in it, in fact, that he neglected his chores and his schoolwork. His first hero was Hannibal. Then he became a student of the American Revolution, and George Washington excited his admiration. He talked history to his classmates so frequently that his senior yearbook predicted that he would become a professor of history at Yale (it also predicted that Edgar would become a two-term President of the United States). During Dwight's high school years his interests were, in order of importance, sports, work, studies, and girls. He was shy around the girls and in any case wanted to impress his male classmates as a regular fellow, just one of the gang. Paying too much attention to the girls was considered somewhat sissy. He was careless of his dress, his hair was usually uncombed, and he was a terrible dancer on the few occasions he tried the dance floor. Studies came easily to him and he made good to excellent grades without extending himself. He got all Bs in his freshman year, when the subjects were English, physical geography, algebra, and German. He did a bit better the next year, and as a junior and senior he was an A or A-plus student in English, history, and geometry. His sole B was in Latin. Sports, especially football and baseball, were the center of his life. He expended far more energy on sports than he put into his studies. He was a good, but not outstanding, athlete. He was well coordinated, but slow of foot. He weighed only 150 pounds. His chief asset was his will to win. He loved the challenge of the games themselves, enjoyed the competition with older and bigger boys, bubbled over with pleasure at hitting a single to drive in the winning run or at throwing the other team's star halfback for a loss. It was in sports that he first discovered his talents as a leader and an organizer. As a boy, he provided the energy and leadership that led to a Saturday-afternoon game of football or baseball. Later, he was the one who organized the Abilene High School Athletic Association, which operated independently of the school system. Little Ike wrote to schools in the area to make up a schedule, and solved the problem of transportation by hustling his team onto freight trains for a free ride from Abilene to the site of the contest. He also organized camping and hunting trips. He got the boys together, collected the money, hired the livery rig to take them to the camping site, bought the food, and did the cooking. The central importance of sports, hunting, and fishing to Little Ike cannot be overemphasized. He literally could not imagine life without them, as was shown by the most dramatic incident of his childhood. During his freshman year in high school, he fell and scraped his knee. This was a common enough experience, and his only thought was for his ruined brand-new pants, which he had bought with his own earnings. Since there was no bleeding, he went to school the next day. Infection set in, however, and that evening he fell into a delirium on the sofa in the front room. His parents called in Dr. Conklin, but despite his treatment, the infection began spreading. For the next two weeks, Dwight slipped into and out of a coma. Conklin called two or three times a day; Ida stayed at his bedside; they painted a belt of carbolic acid around his leg; still the poison spread and crept up his leg toward his abdomen. Conklin called in a specialist from Topeka. The two doctors agreed that only amputation would save his life. During one of his conscious moments, Dwight heard his parents discussing amputation. They distrusted surgery, but the doctors insisted on it. Fourteen-year-old Dwight listened, then said, quietly but firmly, "You are never going to cut that leg off." When his parents told Conklin of his decision, the doctor warned, "If the poisoning ever hits his stomach he will die." By this time the infection had reached his groin and his periods of consciousness were few and short. He called in Edgar and said, "Look, Ed, they are talking about taking my leg off. I want you to see that they do not do it, because I would rather die than to lose my leg." Edgar understood. He made the promise, and from then on stayed at his brother's bedside to make certain that no amputation took place. Conklin grew angry, began mumbling about "murder," but he could not persuade Edgar, or David and Ida, to allow him to amputate. Edgar even slept at night on the floor across the threshold of the door, so that Conklin could not get into the room while Edgar was sleeping. At the end of the second week, the poison began to recede, the fever left Dwight's body, consciousness returned. After a two-month convalescence, which caused him to have to repeat his freshman year, Dwight recovered completely. It was miraculous enough, but became much embellished decades later. Sunday School tracts and inspirational literature described the whole family as down on its knees, night and day, praying for recovery. The Eisenhower boys hated such talk, with its implication that their parents believed in faith healing. They insisted that they prayed no more, and no less, than at other times. "We always prayed," Edgar recalled. "It was just as natural for us to pray, to call upon God for help as it was for us to get up and eat breakfast." And Dwight dismissed the night-and-day-praying stories as "ridiculous." During the summer of 1910, Dwight got to know Everett "Swede" Hazlett, son of one of the town's physicians. He had known Swede only casually before, because Swede had gone to a military school in Wisconsin. Swede had obtained an appointment to the Naval Academy at Annapolis, but in June 1910 had failed the mathematics section of the entrance examination. He had come home to study for a year, in order to repeat the examination the following June. He struck up a friendship with Dwight that became intimate and lasted for the remainder of their lives. Ike's intentions at this time were to work, save his money, and go to the University of Michigan in the fall of 1911. He wanted a college education and an opportunity to play college football and baseball. Michigan had one of the best football teams in the country. Swede pointed out to him that the Naval Academy played football too, that it had at least as much prestige as Michigan, that it guaranteed an interesting useful career to its graduates, and best of all it was free. He wanted Ike to seek an appointment and become his classmate. Ike agreed to try. In September 1910, Ike read in the local paper an announcement of a competitive examination for applicants for the service academies. He took the exam and scored second among the eight candidates, which was good enough for the appointment to West Point, but not the Naval Academy. Swede was disappointed, but Ike was delighted. Ida did not want her boy to become a soldier, but she held back her tears until he boarded the train headed east. David, typically, showed no emotion whatsoever. As he swung onto the train, Ike made a striking picture. He had filled out in the past two years, putting on twenty pounds, none of which was fat. At nearly six feet tall, now weighing 170 pounds, with strong broad shoulders and rock-hard muscles, he was the embodiment of an athlete. He was rawboned, with big hands. He walked on the balls of his feet and carried himself gracefully, as good athletes do. Most people thought him extremely good-looking. He had light-brown hair, large eyes that were clear blue and quite fetching to the girls, and an oversized nose and mouth that fit nicely with his large head. His face was full, round, and symmetrical. His blue eyes sparkled, danced, and looked intently at whatever he saw. He grinned as easily as he breathed, a big lopsided grin that most people found irresistible. He laughed easily, too. He had a marvelously expressive face that still turned beet-red when he was angry, scowled furiously when he was disapproving, lit up when he was pleased. He had an active, curious mind. He wanted to know about history, about sports, about mathematics, about opportunities, about how things worked and what people had done. His curiosity, however, was neither creative nor original. He had no interest in music, or painting, or any of the fine arts, or literature, or political theory. He directed his great energy and powers of concentration on making things work better, not differently. Internally his goal was self-improvement, whether in sports or studies, not self-change. Most of all he knew himself and his capabilities, and as he swung himself up on the train and headed east, away from Abilene, his family, and his friends, he broke into one of his biggest grins. He had no doubts about himself. There was not, for him, the self-searching or identity crisis so often associated with young men. Ike Eisenhower knew who he was and where he was going. The train ride took Eisenhower across the Mississippi River for the first time, and on to the East Coast. At West Point, he found an institution that regarded its own past with veneration and concentrated on instilling that concept in the plebes, or freshmen, filling them with the feeling that the past was a living thing, all around them. Here was Grant's room, there Lee's, there Sherman's. Over there Winfield Scott lived. Here Custer learned to ride. Eisenhower, with a strong sense of military history, responded enthusiastically. In his free time, of which there was precious little, he liked to wander about the Plain, climb the cliffs, look down on the Hudson, reflect on the Point's crucial role in the American Revolution, wonder at what might have happened had Benedict Arnold's attempt to betray the post to the British been successful. Years later he told his son he never tired of such speculation. Hazing, the uglier side of West Point, had little appeal to him, obviously not as a recipient, but not as a Yearling either. Only once, at the beginning of his own third-class year, did he yield to the temptation to haze. A plebe, dashing down the street to carry out an order, ran into him and tumbled to the ground. Reacting with a "bellow of astonishment and mock indignation," Eisenhower scornfully demanded, "Mr. Dumgard, what is your P.C.S. [Previous Condition of Servitude]?" -- adding sarcastically, "You look like a barber." The plebe pulled himself together and replied softly, "I was a barber, sir." Eisenhower turned red with embarrassment. Without a word, he returned to his room, where he told his roommate, P. A. Hodgson, "I'm never going to crawl [haze] another plebe as long as I live. As a matter of fact, they'll have to run over and knock me out of the company street before I'll make any attempt again. I've just done something that was stupid and unforgivable. I managed to make a man ashamed of the work he did to earn a living." Eisenhower's reaction to the incident typified his four years at the Academy. He took from West Point what was positive and rejected that which was negative. West Point was even more cut off and isolated from the rest of the world than Abilene had been. Like Abilene, its self-satisfaction was complete; like Abilene, it had a revealed truth and felt no need to examine it. And that truth reinforced much of what Eisenhower had absorbed in his upbringing. Eisenhower's studies were overwhelmingly narrow and technical, with the emphasis on civil and military engineering. His teachers were, to a man, recent graduates of the USMA. The method of teaching had not changed since the War of 1812. Every day, in every class, every cadet was expected to recite, to give an approved answer to a standard question, and to receive a carefully recorded grade on each response. Often the instructors knew little more than their students. In integral calculus one day, the teacher ordered Eisenhower to do a long, complicated problem on the blackboard. The instructor had previously explained the problem and supplied the answer, but since it had been obvious to Eisenhower that the instructor was doing it entirely by rote he had paid no attention. Thus, when called upon, he had "not the foggiest notion of how to begin." After struggling for almost a full hour, he finally tried a solution that, to his amazement, worked. He was asked to explain his solution; it was shorter and simpler than the rote answer. But the instructor interrupted him to charge that he had merely memorized the answer and then put down a lot of figures and steps that had no meaning. Eisenhower could not abide being called a cheat. He began to protest so vehemently that he was soon in imminent danger of being expelled on a charge of insubordination. Just then, a senior officer from the Mathematics Department walked in. He inquired about the trouble, had Eisenhower go through the solution again, then pronounced it superior to the one being used in the department, and ordered it incorporated into the Mathematics Department's teaching. Eisenhower was saved, but just barely, for a flexible and sympathetic response from the authorities was unusual at West Point. In most cases, there was no room for discussion or exploration of new answers to old problems. English was composition, never literature; history was fact, never inquiry. It was all rote learning, and Eisenhower was good enough at it that he could stay comfortably in the top half of his class without undue exertion. He was especially good in English; while others struggled for days over a theme, he could produce a high-scoring essay a half hour before class. The chief requirement of a good essay at West Point was a logical presentation of fact. At the end of his plebe year, when his class had shrunk from 265 to 212, he stood tenth in English. In other subjects, Eisenhower was content to stay in the middle. He preferred enjoying his classmates to competing with them. These classmates were, generally, like him -- white, rural or small town in origin, middle class, intelligent, and athletic. Eisenhower's own class later became the most famous in West Point's history, "the class the stars fell on." In 1915, 164 of them graduated. Of the 164, 59 rose to the rank of brigadier general or higher, three to the rank of full general, and two to the rank of general of the army. Members included Vernon Prichard, George Stratemeyer, Charles Ryder, Stafford Irwin, Joseph McNarney, James Van Fleet, Hubert Harmon, and Omar Bradley. Eisenhower knew and liked them all, especially Bradley, who became a close friend, and of whom he wrote, in the 1915 yearbook, the Howitzer, "Brad's most important characteristic is 'getting there,' and if he keeps up the clip he's started some of us will someday be bragging that, 'Sure, General Bradley was a classmate of mine.'" The West Point system is designed to find and break the nonconformist, and is usually successful -- Edgar Allan Poe, a cadet in 1830, hated the "God-forsaken place" and, after less than a year, simply walked away. Others, less extreme than Poe, enjoyed testing or bending the regulations, finding out what they could get away with, more or less cheerfully paying the price when they got caught. Eisenhower was one of these. His cadet pranks, which he told with great relish in his old age, as if they were originals, were in fact part of a traditional pattern followed by generations of cadets who managed to adjust to West Point without losing their individuality. Cigarette smoking was strictly forbidden. "So," Eisenhower recorded laconically, "I started smoking cigarettes." He smoked roll-your-own Bull Durhams. His roommate did not approve; other plebes were worried; Eisenhower smoked anyway. When caught by an officer, he walked punishment tours or served room confinement for a number of hours. He continued to smoke. This was only one of his small acts of rebellion. He could not or would not keep his room as neat as the regulations required, was frequently late for formation or guard mounting, often failed in his attempts to dress according to the regulations. For all these, and other, sins, he paid a price in demerits, which counted against him in his final class standing. Of the 164 men in his class who graduated, he stood 125th in discipline. It hardly bothered him; he later admitted that he "looked with distaste on classmates whose days and nights were haunted by fear of demerits and low grades." 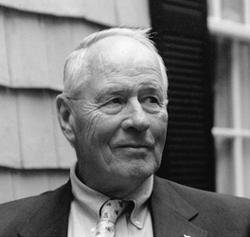 During World War II, he expressed astonishment at the news that one of his classmates had made general office rank; "Christ," he said, "he's always been afraid to break a regulation." His own favorite story about a cadet prank centered on the sometimes absurd literalness of the regulations and orders. Eisenhower and another plebe, named Atkins, were guilty of an infraction. The cadet corporal who caught them, named Alder, ordered them to report to his room after tattoo in "full-dress coats," meaning a complete dress uniform. The two plebes decided to do exactly as ordered, and that night reported to Adler wearing their coats and not another stitch of clothing. Adler roared in anger. He ordered them to return after tattoo "in complete uniform including rifles and crossbelts and if you miss a single item I'll have you down here every night for a week." They did as ordered and suffered through a long session of bracing and lecturing, but the laughs they and their fellow plebes got from Adler's discomfort made it worthwhile. Eisenhower's major escape from the grind was not in petty pranks, but in athletics. Sports remained the center of his life. He said later that he had "a lack of motivation in almost everything other than athletics, except for the simple and stark resolve to get a college education." In his plebe year, he played football for the Cullum Hall team, or junior varsity. Over the winter, to build up his weight, he ate until he thought he would burst. In the spring, he played baseball -- Omar Bradley was a teammate. By the fall of 1912, he was faster, stronger, and bigger -- at 174 pounds -- than he had ever been. He was determined to make the varsity. In the first practice game, he did well. He was, in his words, "as high as a kite." With his improved speed, Eisenhower shifted from the line to the backfield. He got his chance when Army's star ballcarrier, first-classman Geoffrey Keyes, was injured before the first game. Eisenhower led Army to a victory in that game, against Stevens Institute, and was again the star the next week in a win over Rutgers. The New York Times described him as "one of the most promising backs in Eastern football" and carried a two-column photograph of him punting a football. In a victory over Colgate, the West Point yearbook reported that "Eisenhower in the fourth quarter could not be stopped." The following week against Tufts, Eisenhower twisted his knee. There was some swelling and he spent a few days in the hospital, hoping that he would recuperate in time to play in the final game of the season against Navy. But that week, while participating in the "monkey drill" in the riding hall -- leaping off and back onto a galloping horse -- his knee crumbled when he hit the ground. The cartilages and tendons were badly torn. The doctors put his leg in a plaster cast; the pain was so intense that for days he could hardly sleep. His spirits sank even lower when Navy won the game. "Seems like I'm never cheerful anymore," he wrote a friend. "The fellows that used to call me 'Sunny Jim' call me 'Gloomy Face' now. The chief cause is this game pin of mine -- I sure hate to be so hopeless and worthless. Anyway, I'm getting to be such a confirmed grouch you'd hardly know me." He hit bottom when the doctors took off the cast and informed him that he would never play football again. So great was his depression that several times his roommate had to talk him out of resigning from the Academy. "Life seemed to have little meaning," he later recalled. "A need to excel was almost gone." His studies suffered. As a plebe, he had stood fifty-seventh in a class of 212; in his Yearling year, when he hurt his knee, he slipped to eighty-first in a class of 177. But although his playing days were ended, his interest in football was not. He became a cheerleader, which gave him his first experience as a public speaker -- he would address the entire Corps of Cadets the night before a big game, exhorting the members to make an all-out effort as fans the next afternoon. His enthusiasm was matched by his intense study of the intricacies of the game, to the point that the football coach suggested that he coach the junior varsity. He did so eagerly, and with success, sending a number of players on to the varsity and winning most of his games. His experiences as a coach -- and there were to be many more -- strengthened his love for the game. Like many other fans, he made football into something more than just an athletic contest. The act of coaching brought out his best traits -- his organizational ability, his energy and competitiveness, his enthusiasm and optimism, his willingness to work hard at a task that intrigued him, his powers of concentration, his talent for working with the material he had instead of hoping for what he did not have, and his gift for drawing the best out of his players. During World War II, a number of associates compared his techniques as a general with those of a good football coach, pacing up and down the line, urging his team forward. In his private talks with his corps and division commanders, and in his Orders of the Day, Supreme Commander Eisenhower used football slang extensively, urging his men to "pull an end run" and "hit the line" and "break through" and "get that ball across the goal line." Most of all, as a general and as President, he urged teamwork. At the end of his life, he wrote, "I believe that football, perhaps more than any other sport, tends to instill in men the feeling that victory comes through hard -- almost slavish -- work, team play, self-confidence, and an enthusiasm that amounts to dedication." Millions of Americans would agree that the act of playing or coaching football built successful men who could go out and get a job done. Eisenhower graduated from West Point in June 1915. He had drifted into the Academy and, as a student, drifted through it. He had obtained a free education and the Academy had sharpened his sense of duty. Following graduation, and before going on active duty, Second Lieutenant Eisenhower spent the summer in Abilene. His constant companion was Gladys Harding, the blond daughter of the man who owned the freight business in town. They had dated when in high school, but at that time they were not "serious." Ike also dated Ruby Norman and other local girls. In July 1915, however, he fell madly in love. Evidently Gladys' father warned her that the "soldier boy" was not for her, but when Ike reached his first duty post in San Antonio, in August, he wrote her: "More than ever now I want to hear you say the three words more than I ever have....For, girl, I do love you and want you to know it. To be as certain of it as I am. To believe in me and trust in me as you do your dad." A week later, he wrote her that "your love is my whole world. Nothing else counts at all." On reading her letter to him, "my eyes filled with tears and I simply had to stop and whisper over and over I love you Gladys, I love you Gladys. And now my beautiful lady, I'm going to read your letter once more, then I'll meet you in dreamland, if you will meet me there. And there, as sometime in reality, you shall be my dearest and closest friend, my own sweetheart and true blue wife." It was not to be. Whether because of her father's opposition, or because she wanted to pursue a career as a serious piano player, Gladys put him off. On the rebound, he found another. Feeling rebuffed, so did she. Each married, and lived their separate lives, she in Abilene, he around the world. In his letters to friends back in Abilene during the war, Ike included Gladys in a list of four or five people he wanted to say hello to; when her husband, Cecil Brooks, died in 1944, he wrote Gladys a short letter of condolence. When Ike became President, Gladys bound up his love letters, along with a faded rose, and gave them to her son with a note: "Letters from Dwight Eisenhower when we were young and happy, 1914 and 1915. Not to be opened or published in any way whatsoever until after his death and Mamie's and also after my death." They remained under seal until more than three-quarters of a century after they were written. As he set off for his first assignment, at Fort Sam Houston, Texas, he was determined so long as he was an officer in the United States Army, he would do his best to be a good one. It was a resolve rather than an ambition, and sprang from a sense of obligation and responsibility rather than from a competitive drive, for he felt that with the end of his sports career, his competitive days were over. His duties in the peace-time Army were light, and hardly took up all of his time. When on his own, he played poker with the other junior officers, winning consistently, went drinking and hunting with them, and generally got on fine with his contemporaries. He made some lifelong friendships, including Walton Walker, Leonard Gerow, and Wade Haislip (each of these lieutenants became a four-star general). And he fell in love. The romance began on a Sunday afternoon in October 1915, one of those perfect autumn days in South Texas. Ike was Officer of the Day. Putting on his newly cleaned and pressed uniform, his boots, brightly polished by his orderly, and his service revolver, he walked out of the Bachelor Officers' Quarters to make an inspection of the guard posts. Across the street, on the lawn of the Officers' Club, sitting on canvas chairs enjoying the sunshine, a small group of women was gathered. Ike walked across the street to say a polite hello to the ladies. "The one who attracted my eye instantly," he later recalled, "was a vivacious and attractive girl, smaller than average, saucy in the look about her face and in her whole attitude." She was wearing a starched white linen dress and big, floppy black hat. She had just arrived in Texas for the season -- she lived in Denver during the hot months -- and she was renewing her many friendships at Fort Sam. She was eighteen years old. Her name was Mary Geneva Doud, but she was known as Mamie. Mamie's first thought on seeing Ike walk out of the BOQ resplendent in his brass buttons, determined in his stride, big in his shoulders, had been, "He's a bruiser." As he came closer, her next thought was, "He's just about the handsomest male I have ever seen." When he asked her to accompany him as he walked his rounds, she accepted. The following day, when Mamie returned home from a fishing expedition, her maid informed her that a "Mr. I-something" had been calling every fifteen minutes all afternoon. The phone rang. It was "Mr. 1-something." Very formally, Ike asked "Miss Doud" to go dancing that night. She said she had a date. The next night? Another date. And so on until finally he made a date for a dance four weeks away. Having established her popularity, before hanging up Mamie also established her feelings -- "I'm usually home about five," she said. "You might call some afternoon." Ike said he would be there the next day. Ike persuaded her to cancel her dates; they went out together every evening. His $141.67-per-month pay, even though supplemented by poker winnings, limited them to dollar-per-couple meals at a Mexican restaurant and a once-a-week show at the vaudeville house. To save money, he gave up store-bought cigarettes and returned to rolling his own. On Valentine's Day, 1916, he proposed and she accepted. They sealed the engagement with his West Point ring. When he formally asked Mr. Doud for his daughter's hand in marriage, Doud consented, but only if he would agree to wait until November, when Mamie would be twenty years old. Doud told Eisenhower that the couple would be on their own financially, and warned him that Mamie might not be able to adjust from her carefree life to that of an Army wife. She was accustomed to having her own maid and a generous allowance. He made a similar speech to his daughter, in addition pointing out to her that she was agreeing to a life in which she would be constantly on the move, frequently separated from her husband, and often worried about him. She said that she understood and looked forward to the challenge. That spring of 1916, Ike and Mamie decided to push forward the date of their wedding. The Douds agreed. Ike got ten days' leave, and on July 1, 1916, in the Douds' spacious home in Denver, they were married. Ike wore his tropical dress uniform, stiffly starched and dazzling white, the crease so sharp he would not sit down; Mamie wore a white Chantilly lace dress, her hair in bangs over her forehead. Doud's chauffeur drove them to Eldorado Springs, Colorado, for a two-day honeymoon. Then they took the train for Abilene, so that Mamie could meet the Eisenhower family. They arrived at 4 A.M. David and Ida were up, waiting for them. They liked Mamie at once, and she them, especially after they told her they were so glad to finally have a daughter (Dwight was the first of their sons to marry). When Earl and Milton came downstairs, Mamie charmed them by saying, "At last I have some brothers." Ida served a fried chicken breakfast. Back at Fort Sam, they settled into Ike's three-room quarters in the BOQ. He concentrated on his work; she concentrated on him. Ike had a firm expectation about his wife's role, which was to center her life around his. That suited Mamie. She was six years his junior; she had been trained for such a role in her Denver finishing school; she had watched her mother devote herself to pleasing her father. As an Army wife, she was ideal. She loved to entertain, as did he, and in a society in which everyone knew exactly how much everyone else earned, there was no need for pretense. Beans, rice, and beer more than satisfied the junior officers and their wives who were their guests. They sang popular songs at the top of their lungs, Mamie playing a rented piano. Eisenhower's favorite was "Abdul the Bulbul Amir," to which he knew some fifty verses. Their apartment came to be known as "Club Eisenhower." Mamie taught her man some of the social graces. "She takes full credit for smoothing the edges off the rough-and-ready Kansan," her son John told an interviewer, "and for teaching him some of the polish that later put him in good stead." She did not share his love of the out-of-doors, nor of athletics or physical exercise of any kind. But they both enjoyed talking, to each other and to other people, and playing cards together, and music and entertaining. Best of all she never complained, although she had much she might have complained about. In the first thirty-five years of their marriage, they moved thirty-five times. Not until 1953 did they have a home they could call their own. Until World War II, with one exception, in 1918, he was never the CO, so she always had to defer to someone else's wife. His progress in the Army, after World War I, was excruciatingly slow. She had to manage the money to the penny, and watched as he turned down numerous offers for civilian employment at substantially higher salaries. But she never nagged him to leave the Army, never told him that the time had come for him to make something of himself. In April 1917, the United States entered World War I. Eisenhower stayed at San Antonio, training the 57th Infantry. He did well at it, using the same skills he had developed as a football coach, and earned the high praise his superiors gave him in his 201 file, the official record of an officer's career. He was promoted to captain. But he was impatient to get to France. Training troops was like coaching football all week without ever being able to play a game on Saturdays. He had more than the normal American male's mystique about combat; he had been trained, at considerable expense, to fight; his place was on the fighting line, not on the sidelines. He was dismayed, therefore, when in mid-September his orders finally came, and he learned that the War Department was sending him to Fort Oglethorpe, Georgia, to train officer candidates. In Georgia, he helped construct a miniature World War I battlefield, complete with trenches and dugouts, in which he and the trainees lived while they practiced assaults across no-man's-land. Oglethorpe had none of the advantages of active service, but many of the disadvantages, the chief being that Mamie could not be with him and was thus in San Antonio, when, on September 24, 1917, their first son was born. She named him Doud Dwight and called him "Icky." As a trainer of troops, Eisenhower managed to impress his superiors and his trainees. One of the latter wrote, "Our new Captain, Eisenhower by name, is, I believe, one of the most efficient and best Army officers in the country...He has given us wonderful bayonet drills. He gets the fellows' imaginations worked up and hollers and yells and makes us shout and stomp until we go tearing into the air as if we meant business." In February 1918, he received orders to report to Camp Meade, Maryland, to join the 65th Engineers, the parent group of the 301st Tank Battalion, which was slated to go to the battlefield in the spring. Elated, he threw himself into the job. The men were all volunteers, morale was high, expectations even higher. Although none of the men had actually seen a tank, they were convinced that with the new weapon they would break through the German lines and drive straight to Berlin. Insofar as he could do so from newspaper accounts, Eisenhower studied the Battle of Cambrai (November 1917), where the British for the first time used tanks to achieve a breakthrough. They had not gathered together enough tanks to exploit the victory, but they had shown what could be done. In mid-March, he was informed that the 301st would soon be embarking for France from New York, and that he was to be its commander. Exuberant, he rushed to New York to make certain that the port authorities were prepared for the 301st. "Too much depended on our walking up that gangplank," he wrote, "for me to take a chance on a slip anywhere." Back at Meade, elation gave way to more despair. The War Department had changed his orders. His superior's praise of his "organizational ability" had been so lavish that the authorities had decided to send him to Camp Colt, in Gettysburg, Pennsylvania. It was an old, abandoned camp, on the site of the great Civil War battle. The War Department had decided to reorganize its armored units, take them away from the 65th Engineers and give them an organization of their own, the Tank Corps. The tankers were to be trained at Camp Colt, with Eisenhower in command. It was, on the face of it, a choice assignment. At twenty-seven years of age, Eisenhower was to be in command of thousands of men, all of them volunteers. He would be working with the weapon of the future (although he was given no actual tanks, nor training manuals, nor experienced armored officers to work with). He could expect a promotion. He was able to rent a house in town, so his wife and son could live with him. Nevertheless, he later confessed, "my mood was black." He completed the preparations for the 301st to embark, then watched the unit sail with a sinking heart. Eisenhower was certain that the War Department had made a terrible mistake, but in fact, in its wisdom, it had made an excellent selection for the commander at Camp Colt. Working with whatever materials he could find, he transformed the historic ground of Pickett's charge from an open wheat field into a first-class Army camp. He obtained tents, food, and fuel for his men. He taught them to drill, got them into shape, kept up their morale by establishing a telegraph school, then a motor school. By mid-July, he had ten thousand men and six hundred officers under his command, but still no tanks. He went to Washington, badgered the War Department into giving him some old Navy cannons, and drilled his men in their use until they were proficient. He managed to obtain some machine guns; soon his men could take them apart and put them back together again while blindfolded. He mounted the machine guns on flatbed trucks and taught the men to fire the weapons from a moving platform. He used Big Round Top as a backstop and soon the firing there was heavier than it had been during the battle fifty-five years earlier. He was always trying to improve the training and lift the morale. To that end, he wanted suggestions and ideas from his subordinates, not praise. One of his young lieutenants, anxious to please, nevertheless praised every aspect of his administration. "For God's sake," Eisenhower cut him off one day, "get out and find something wrong with the camp! It can't be as good as you say it is. Either you're not being frank, or you're as big a fool as I am." The men responded to his leadership. "Eisenhower was a strict disciplinarian," his sergeant major, Claude J. Harris, declared, "an inborn soldier, but most human, considerate, and his decisions affecting the welfare of his officers and men were always well tempered...This principle built for him high admiration and loyalty from his officers perhaps unequaled by few commanding officers." On October 14, 1918, his twenty-eighth birthday, Eisenhower was promoted to lieutenant colonel (temporary). Even more welcome were his orders -- he was to embark for France on November 18, there to take command of an armored unit. He put Mamie and Icky on a train for Denver and went to New York to make certain that the port authorities were ready for his men and that nothing would go wrong with the embarkation. Then, on November 11, the Germans signed the Armistice. Captain Norman Randolph was sitting in Eisenhower's office when the news arrived. "I suppose we'll spend the rest of our lives explaining why we didn't get into this war," Eisenhower moaned. "By God," he added, "from now on I am cutting myself a swath and will make up for this." But whatever his determination, glittering combat possibilities had turned into demobilization realities. Eisenhower supervised the discharge of thousands of men, the tearing down of Camp Colt, the movement of the remnants of the Tank Corps to Fort Benning, Georgia. Eisenhower was deflated and depressed. He could hardly believe it had happened to him -- he was a professional soldier who had missed action in the greatest war in history. He had never heard a shot fired in anger and now did not expect to in his lifetime. He worried about what he would tell Icky when his son asked him what he did during the war. He envisioned having to sit silent at class reunions when his fellow officers talked about their experiences and exploits in combat. When he met a young officer at Benning who had been in France and who complained that there had been no promotions over there, he snapped back, "Well, you got overseas -- that should be promotion enough!" In 1919, Colonel Ira C. Welborn recommended him for the Distinguished Service Medal. The award finally came through in 1922. It praised Eisenhower for his "unusual zeal, foresight, and marked administrative ability." To Eisenhower, it was more a bitter reminder than a welcome award. Publishers Weekly The definitive one-volume biography of Eisenhower. Robert J. Donovan The best book to date on its subject....Of Eisenhower's high rank on the list of presidents there can he little doubt. John Keegan A magnificent biography. James MacGregor Bums Fascinating....An important case study in military and political leader ship.